In Euchre, it is important to learn how to read the upcard during the bidding process. It will provide you valuable information on which hands to pass or call. With some practice, you should be able to determine if your partner is strong in a particular suit. In fact, if you develop this skill, your opponents will begin to wonder if you are stacking the deck. Euchre is a positional game, perhaps more than other card games. The position is determined by the dealer. The player sitting to the left of the dealer is called the first seat or first base. 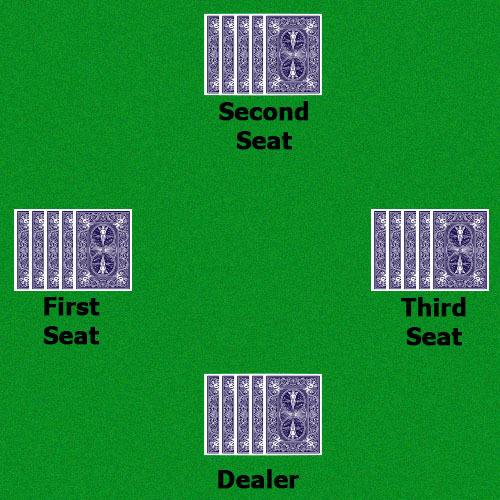 The dealer’s partner is called the second seat, the player sitting to the right of the dealer is called the third seat. As each player passes during the bidding process, it will reveal the relative strength of each player’s hand. The color of the upcard helps determine the strength of your opponent’s hand. This idea may seem odd at first, but jacks play in two suits of the same color. If the color the upcard is red, and your opponents pass. You can estimate that their hands are relatively weak in hearts and diamonds. The rank of the upcard says a lot in the strength of your opponent’s hand. Players are more likely to call trump if the upcard is an ace rather than a nine or a ten. Thus, if your opponents pass when an ace is showing, you can conclude that they do not have a bower in the color of the upcard. If your opponents are calling hands very frequently and aggressively, then it is more than likely they are naming trump because they possess one of the bowers. Therefore, if they pass, they do not have a bower in the color of the upcard. The first seat is a difficult place to call trump. It has the least amount of information to call. It gives the dealer a trump card and the ability for him to create voids. On the other hand, the first seat has the ability to lead the first card, which has an obvious advantage. If you are going to call from the first seat, you should be holding a strong hand. It is useful to have an extra trump or ace to help you win three tricks. Going alone should be strongly considered. If you are sitting in the second seat, you should instinctively try to call trump, because it would give your partner a trump card. This advantage enables the second seat to call riskier hands than normal. The only exception to calling a biddable hand from the second seat is when the upcard is a bower. If you know that the dealer will pick up the bower regardless of the strength of his or her hand, you should give the dealer an opportunity to go alone. Do not call from this seat unless you have three guaranteed tricks. The third seat is the hardest seat to call because you improve the dealer’s hand, and you must rely on your partner to lead trump. If you can call from this position, going alone should be highly considered. If you are the dealer, you should instinctively try to pick up the card. The dealer is technically playing with 6 cards, and thus, the seat has the most flexible hand. You can easily create voids, or discard the least valuable card. Even slightly risky hands should be considered because it doesn’t allow player sitting in the first seat to name trump. After the dealer has turned down the upcard, a lot of information has been gained. If you are sitting in the first seat and the dealer has turned down the upcard, you can safely assume that your opponents are weak in the color of the upcard. If your opponents are weak in one color, then they are likely stronger in the color opposite of upcard. Therefore, you should consider calling the “next suit.” If you call trump in a color other than next, do not expect a lot of help from your partner. The second seat should adopt a “reverse next strategy”. If your partner couldn’t call trump with the upcard, your partner is likely weak in the same color as the upcard. Therefore, you should call trump in color opposite of the upcard, often called “reverse of next” or simply “reverse next”. Calling trump in the next suit can be done, but don’t expect any help from the dealer. If you are sitting in the third seat, you should adopt a “Second-chance Next Strategy.” In general, your partner wanted to call next, but their hand may have been too weak to call. So the third seat has another opportunity to call next. Your partner will likely have one or two cards in the next suit, and therefore it would make it easier for your partner to lead trump. If you name trump other than next, it is only considered to be slightly risky. Since everyone except the dealer has passed, you can assume that the bowers are buried or spread even around the table. Hence, if you have a biddable hand in any suit, you should name trump. If you are the dealer, and the bidding has come back to you for the second time. Primarily, you should adopt a “Second-chance Reverse Next Strategy.” Your partner wanted to call a suit reverse of next, but their hand may have been too weak to call. So you have another opportunity to call reverse next. It also should be noted that the cards are very evenly distributed, and the Aces will likely go around the table without being ruffed. If the dealer is too weak to call a “Second-chance Reverse Next” suit, simply pass, or if you are playing stick the dealer, you should pick trump which maximizes the number of trump cards and non-trump aces.